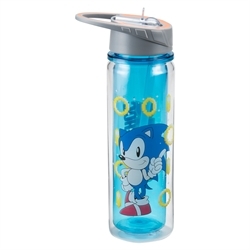 Everyone’s favorite hedgehog is springing into action, and it looks like things are trending to blue. 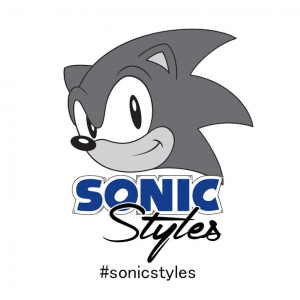 Starting Wednesday, a newly launched Instagram kicks off — @SonicStyles, and Sonic the Hedgehog will now bring all things stylish to the popular platform. Tomy Sonic Boom Action Figures: NYC Times Square Adventure. 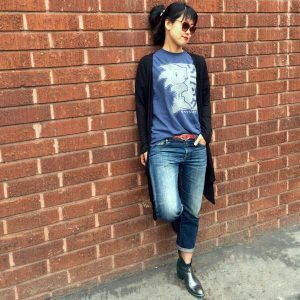 I received a few really cool products and I love them! 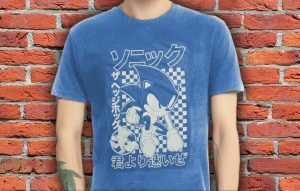 My favorite is a Really cool Blue Shirt with Sonic on the front! 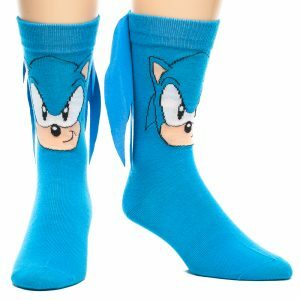 The Socks are super cute and comfy and my 12-year-old son thinks that they are pretty cool! The Water bottle is a big hit with everyone in the family! 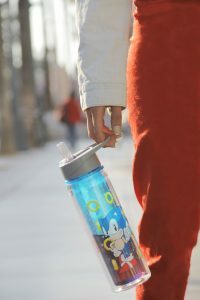 This one is a must-have for Summer travel! More than ever before, modern day dads are taking an active role in parenting activities, from waking up for late night feedings to changing dirty diapers. This Father’s Day, give the new dad or dad-to-be in your life these essentials to make the transition to fatherhood as smooth as possible. From innovative strollers to baby sports apparel, here are the five best new products to get guys excited about their first Father’s Day! XYIENCE Energy Drink: New dads need energy like never before, but they don’t need the extra calories that come with most energy drinks, especially when there’s suddenly less time to make it to the gym. XYIENCE energy drinks have zero calories and zero sugar, are available in eight great-tasting flavors and will keep the “Dad Bod” at bay. Jogging Stroller: Having a baby makes exercise more difficult, but certainly not impossible – dads just have to get creative. Take junior on a run with a BOB jogging stroller. Dad gets a workout and baby gets some time outside. That’s what we call a win-win. Baby Carrier: How else are new dads going to re-enact The Hangover? This hi-tech baby carrier sports 3D Air Mesh fabric to keep junior cool so Dad doesn’t feel like he has a space heater strapped to his chest. Skip the stroller and let those cute little legs dangle. Sports Team Apparel: Bonding with baby is the perfect way to justify spending Sunday on the couch watching football. Introduce junior to all of Dad’s favorite teams with Baby Sport’s wide selection of NCAA, MLB, NBA and NFL officially licensed baby clothing. Camera: Dad’s iPhone camera is adequate for the occasional pic, but shouldn’t be relied on to capture the moments you’ll be enjoying for a lifetime. Having a baby is a perfect excuse to invest in a top-notch DSLR camera. Get baby smiling and snap some cute shots of the little model in the making. We had the opportunity to try out the XYIENCE Energy Drinks and I really liked the taste! I don’t care for many Energy Drinks because I don’t like the taste but these come in flavors like Cherry Lime and Fruit Punch! Launched in 2006 and now headquartered in Austin, Texas, XYIENCE is the original zero calorie energy beverage with all natural flavors and colors. XYIENCE is available in eight exclusively zero calorie flavors: Cherry Lime, Mango Guava, Frostberry Blast, Blue Pomegranate, Cran Razz, Fruit Punch, Tangerine and Melon Mayhem. XYIENCE is marketed strictly to consumers ages 18 and over. XYIENCE was acquired by Big Red, Inc. in 2014. Find more info about XYIENCE online at www.xyience.com or at a retailer near you. Connect with XYIENCE on Facebook, Twitter, Instagram and YouTube. Self Disclosure: I received free samples of XYIENCE. Tips and photo provided by XYIENCE. Looking for graduation gifts? Gone Reading has you covered! They have such a variety of gift ideas for Readers! I love so many of their products! Two of my current favorites are the Lewis Carroll Mug and the Alphabook Journals! These both are must-buys! 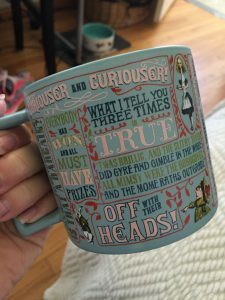 The Lewis Carroll Mug is a must-have for any Alice In Wonderland fan! I love the size and all the artwork, imagery and quotes from Carroll’s works. It comes in a decorative box just perfect for gifting! It is also Microwave and Dishwasher safe! This is the perfect Mug to use for Coffee Drinking in College! Each Lewis Carroll Mug measures 3-3/4″ in diameter x 3-1/2″ high and holds 12 ounces of your favorite hot beverage. Retails for $13.95. The Alphabook Journal is available in letters A-Z! This is a really clever gift for all ages! My 12-year-old son loved the letter “J” that I gave him! He likes that the pages are blank so he can also draw. 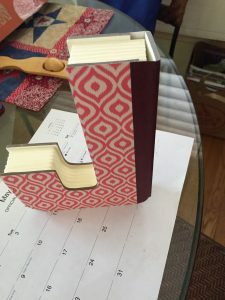 Although the size of each Alphabook Journal varies by letter, each is generally up to 5.5″ wide by 7.5″ tall. Retails for $19.99. NOTE: Each Alphabook is made with one of several different color patterns (see photos for examples). You might not receive the exact color pattern(s) pictured with your particular choice of Alphabook journal(s). Find these and many more wonderful gift ideas at Gone Reading! Tinkerbelle is Pet of The Week! Remember how Tinkerbell helped Peter Pan fly with her magic dust? Tinkerbelle, who spells her name slightly differently, can do that for herself with her huge ears. 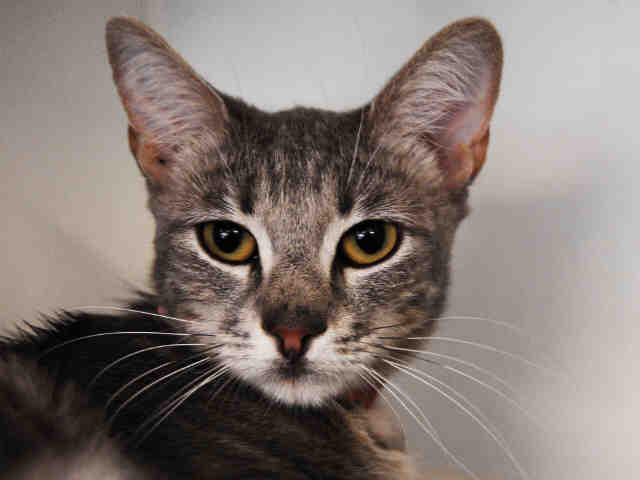 Tink is a sweet 9-month-old female brown tabby who’d actually prefer to curl up with you and share your quiet activities or chase a toy all over the room.. Can you take Tinkerbelle to Forever-Ever Land? Meet her on the shelter side at the P.D. Pitchford Companion Animal Village, 7700 E. Spring St., Long Beach, at the entrance to El Dorado Park (no parking fees apply for parking for Animal Village guests! ).